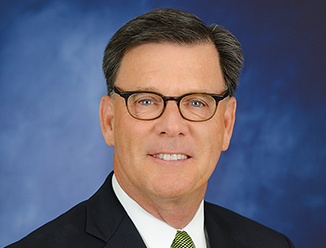 Phil Puckett is a Vice Chairman in the Dallas office of CBRE, where he and his team specialize in office tenant representation in Downtown and Uptown. Mr. Puckett has over 30+ years of individual experience and he has now completed over 6 million SF of tenant representation transactions in Downtown and Uptown of which over 1.7 million SF has been in representing major law firms. Phil has become well known as the office specialist in Downtown and Uptown Dallas. Phil was selected by D CEO Magazine as one of the Top 500 Most Influential Business People in Dallas and was recently selected as "2017 Broker of the Year" by D CEO. In addition, Phil was also recently awarded the "2017 Office Broker of the Year" by NAIOP. Mr. Puckett has also represented some of the largest office transactions in Downtown and Uptown including Bank of America for 566,000 SF, Comerica World HQ for 220,000 SF, Tenet Healthcare for 213,000 SF, PriceWaterhouse for 193,000 SF, Ernst & Young for 142,000 SF, Baker Botts for 104,000 SF, Vinson & Elkins for 80,000 SF and Akin Gump for 74,00 SF and many others. Phil recently represented Dallas Morning News for their new 90,000 SF headquarters and AT&T's World HQ for 971,000 SF. Throughout his career Mr. Puckett has been recognized as a leader in Downtown and Uptown Dallas by both his peers and numerous industry organizations. The Dallas Business Journal has selected him as a four (4) time winner of the #1 Heavy Hitter in office brokerage and was again selected as the 2016 Office Broker of the Year and was just awarded the 2017 largest urban office lease award for his representation of PwC. Mr. Puckett has also been awarded (3 times in his career) the Dallas Office Broker of the Year by NAIOP. In addition, Mr. Puckett was selected to serve on CBRE’s International Law Firm Practice Group Executive Committee given his law firm experience. Prior to the merger in 2006 of CBRE and Trammell Crow Company, Mr. Puckett joined Trammell Crow in 1997 to assist in what became one of the most powerful office brokerage firms in Downtown and Uptown. Mr. Puckett also serves on the Klyde Warren Park PID Board of Directors and has been instrumental in presenting the economic impact of the Klyde Warren Park to other organizations such as the Urban Land Institute (ULI). Phil was on the presentation committee that won the ULI’s national award known as the Open Spaces Award for the Klyde Warren Park. It should also be noted that Mr. Puckett won CBRE’s National Innovation Award for his creation of the Downtown – Uptown DASHBOARD. The Dashboard is a software based technology tool to assist clients in their office building selection in Downtown and Uptown and has played a major role in assisting Phil’s law firm clients. Throughout his career Mr. Puckett has been recognized as a leader in Downtown and Uptown by both his peers and numerous industry organizations. The Dallas Business Journal has selected him as a four (4) time winner of the #1 Heavy Hitter in office brokerage – which has only been accomplished by one other broker in Dallas. Mr. Puckett has also been twice awarded Office Broker of The Year by NAIOP. In addition, Mr. Puckett was selected to serve on CBRE’s International Law Firm Practice Group Executive Committee given his law firm experience. Prior to the merger in 2006 of CBRE and Trammell Crow Company, Mr. Puckett joined Trammell Crow in 1997 to assist in what became one of the most powerful office brokerage firms in Downtown and Uptown. Phil was consistently named as one of the top office brokers in the United States at Trammell Crow Company and served on Trammell Crow’s National Operating Committee. Today at CBRE Mr. Puckett continues to be a top producer in the CBRE-Dallas office. It should also be noted that Mr. Puckett won CBRE’s National Innovation Award for his creation of the Downtown – Uptown DASHBOARD. The Dashboard is a technology tool to assist clients in their office building selection.